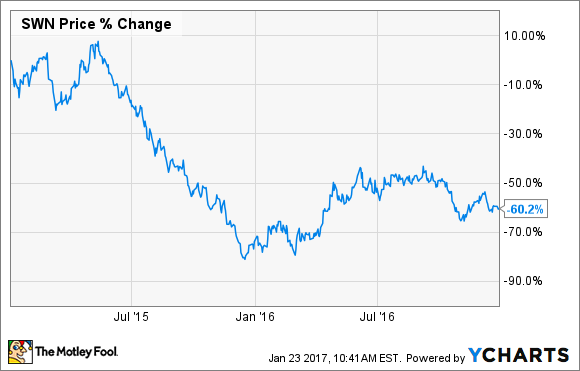 Is There Any Growth Left for Southwestern Energy Company's Stock in 2017? The natural gas driller rebounded sharply after an abysmal 2015 but still has a long road to recovery ahead of it. Suffice it to say, there's plenty of recovery potential as the company continues to put its awful performance during 2015 in the rearview mirror. Southwestern Energy entered 2016 focused on three initiatives: Strengthening the balance sheet, enhancing margins, and optimizing its portfolio. To achieve the first aim, the company chose to temporarily halt its drilling activities until commodity prices improved, which would enable it to live within cash flow. Second, it worked with midstream partner Williams Companies (NYSE:WMB) and negotiated a reduction in certain of its gathering, transportation, and processing rates to improve margins. That transaction with Williams Companies would save Southwestern Energy $35 million in 2016 while opening new growth opportunities for both companies in the future. Finally, the company worked on several initiatives to optimize its portfolio, including selling a portion of its southwest Appalachia acreage to Antero Resources (NYSE:AR) for $450 million. Southwestern Energy further strengthened its finances by completing a $1.25 billion secondary offering. The company used the cash from the secondary offering and the Antero Resources transaction to pay down a significant amount of debt. Because of those transactions, as well as an improvement in commodity prices, the company had the cash to resume drilling by mid-year. That decision would push 2016 production 5% above the company's guidance and positioned Southwestern Energy to ramp up production even further in 2017. What needs to happen this year to maintain that momentum? Source: Southwestern Energy Investor Presentation. The high-end represents a robust growth rate for a company of its size. For perspective, the nation's second-largest gas producer, Chesapeake Energy (NYSE:CHK), sees its output rising 5% to 15% annually through 2020. Meanwhile, smaller rival Antero Resources expects to grow 20% to 25% this year, while delivering 20% to 22% annual growth from 2018 to 2020. However, that is off a lower production base of roughly 657 billions of cubic feet equivalent compared to 870 billions of cubic feet equivalent for Southwestern. That said, there's a big difference between Southwestern's high-end projection and its lower end estimate. If the company's growth comes in at the bottom end of the range, it will fall further behind larger rival Chesapeake Energy, which could cause its stock to stagnate. That is why the company needs to demonstrate that it can grow closer to the higher end of its range while living within cash flow around current commodity prices. That would differentiate it from Chesapeake, which doesn't anticipate living within cash flow until next year, and that is assuming $60 crude and $3 natural gas. One thing Southwestern Energy could do to ensure it can grow toward the higher end is to optimize its portfolio further by selling additional non-core assets. It could then use those proceeds to reduce debt and accelerate drilling activities, which could ignite another rally in the stock price. Southwestern Energy worked hard to reposition the company last year and was rewarded with a higher stock price. That said, its stock still sits well below the former peak, which suggests that there's plenty of running room in 2017. For the momentum to continue, the company needs to prove it can grow as fast as its rivals, which it might be able to do if it completes more asset sales, providing it with additional fuel to achieve high-end production growth.